Harvest is always the high point of our day. And when we can pick something that is a favourite of our CSA members & market customers, and a crop that is eagerly awaited – well, that’s even better! Garlic scapes are good, as is green garlic, but everyone awaits the new crop of those pungent, tasty bulbs of deliciousness. 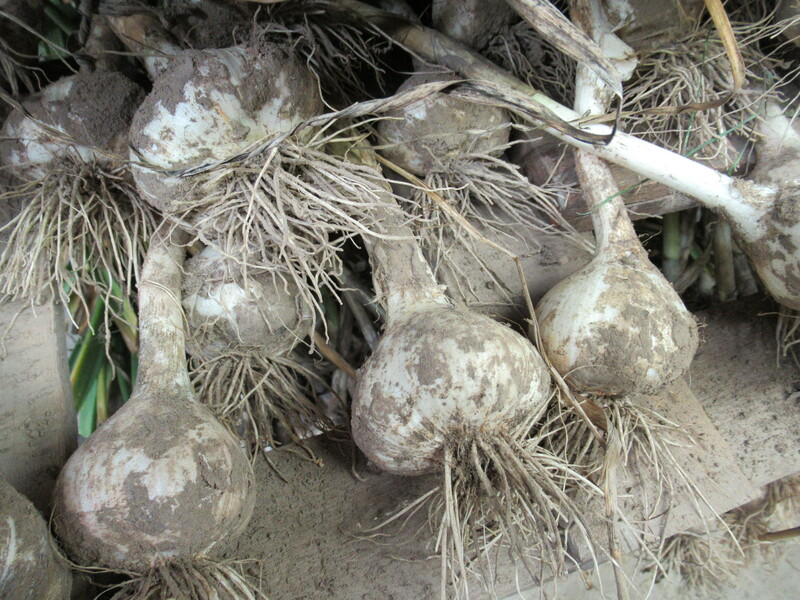 We pulled much of the crop today – mostly large, firm, beautiful bulbs of garlic. They are now spread on the drying racks in the barn, filling the air with their perfume. 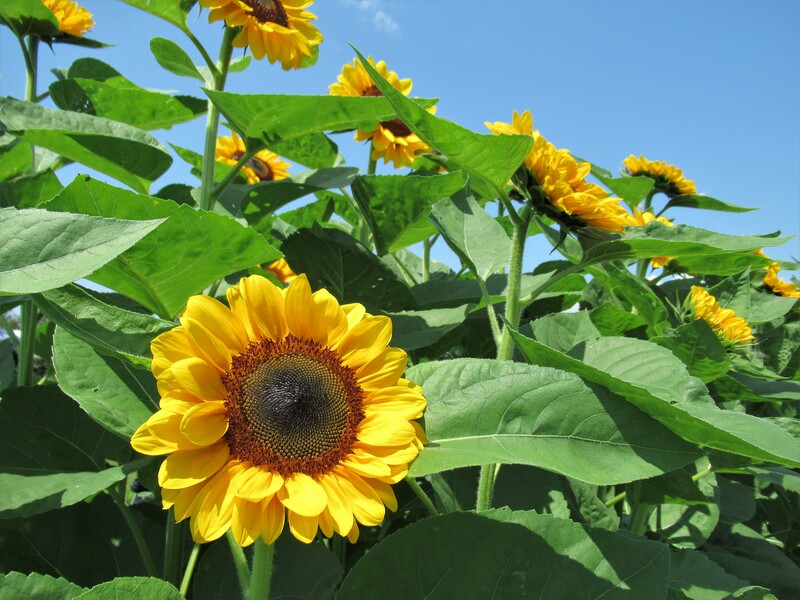 Another favourite crop – or at least one that brings a big smile to people’s faces – is sunflowers. Our sunflowers are blooming! The first few that we brought to market on Saturday were snapped up in a hurry. People love sunflowers! 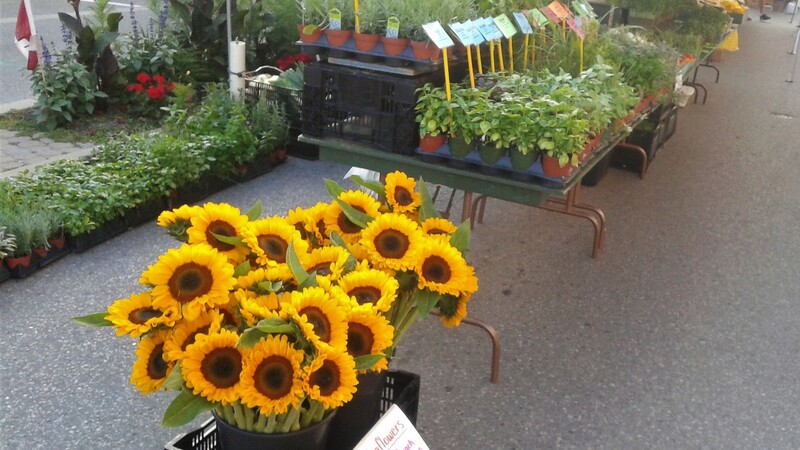 We will have lots of sunflowers for sale at market this week and at CSA pick-up. Fresh garlic, beans, tomatoes, lettuce, zucchini, cucumbers, onions. Why wait? Enjoy a fresh bulb of new garlic. Because it is not dried, it should be kept someplace with good air circulation, and out of the sun. Do not put in plastic or in the fridge. Once the bulb has been started, try to finish using it within a few days. 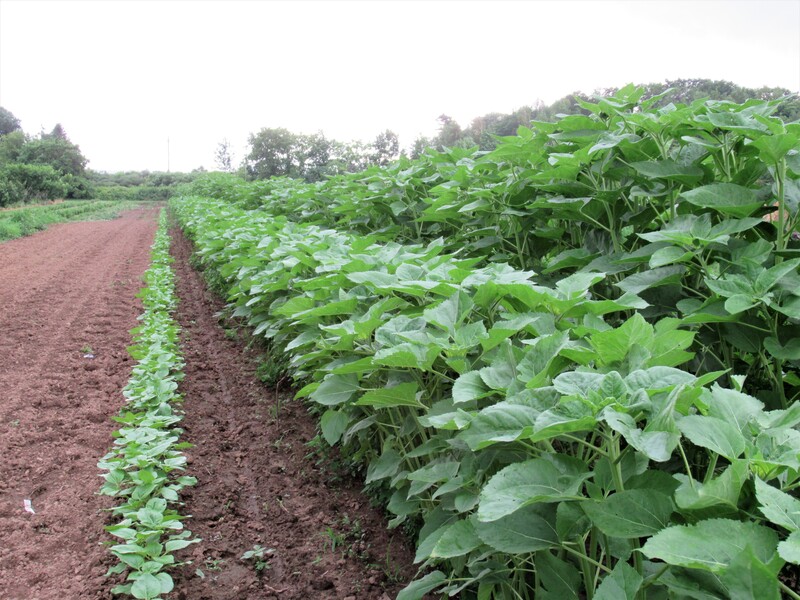 Our new rows of beans are healthy & producing well now, and back in the box this week. 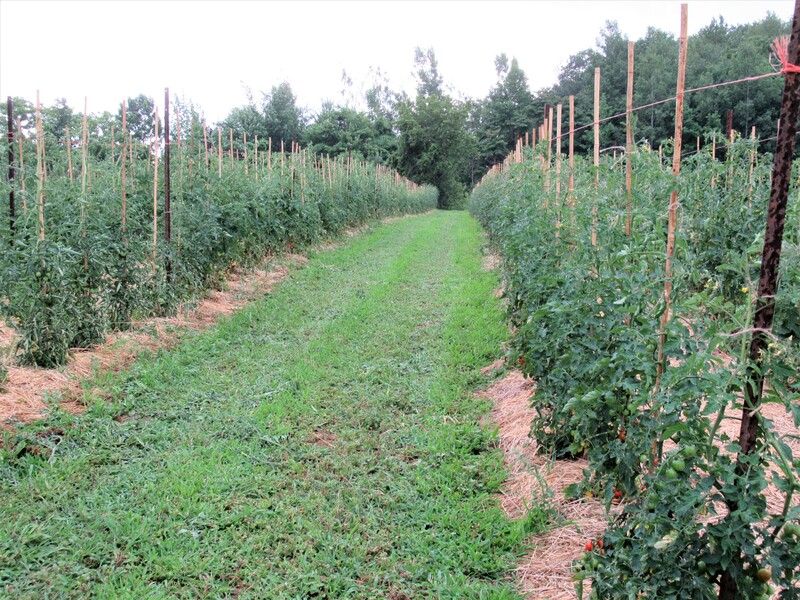 Every time we pick tomatoes, more varieties are ripe. There may even be a few large tomatoes by the end of the week. Last week the zucchini plants looked poorly. They still do, but at the same time they’re putting on new, fresh growth with lots of new blossoms. We got a nice pick today. Here’s hoping it continues. Today we transplanted a new batch of zucchini plants into the field. They should be producing in about a month. Onions & (the last of the) cucumbers round out your CSA share this week. Toss zucchini with salt. Transfer to a strainer & set over a bowl. Drain off excess water for about 15 minutes. Pat dry. Heat oil in a skillet over medium heat. Add zucchini & sauté until tender, about 3 minutes. Add garlic and cook until garlic is fragrant & zucchini is beginning to turn golden, about 7 minutes. Transfer to a bowl and cool completely. Stir in yogurt, tahini, lemon juice, & dried mint. Season to taste with salt & pepper. Heap into a bowl and garnish with cumin and fresh mint. 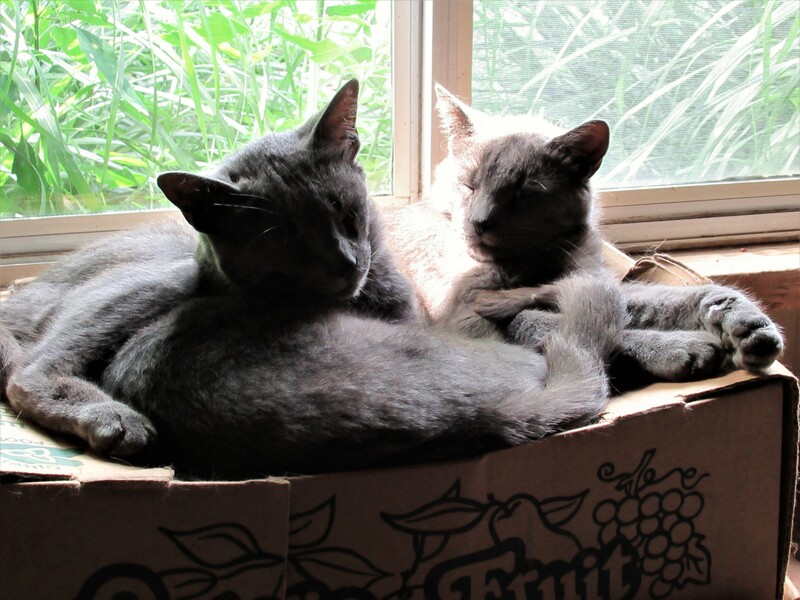 Brothers Flynn & Flynn enjoying the summer sunshine! There are some weird & wonderful things growing on the farm this season. 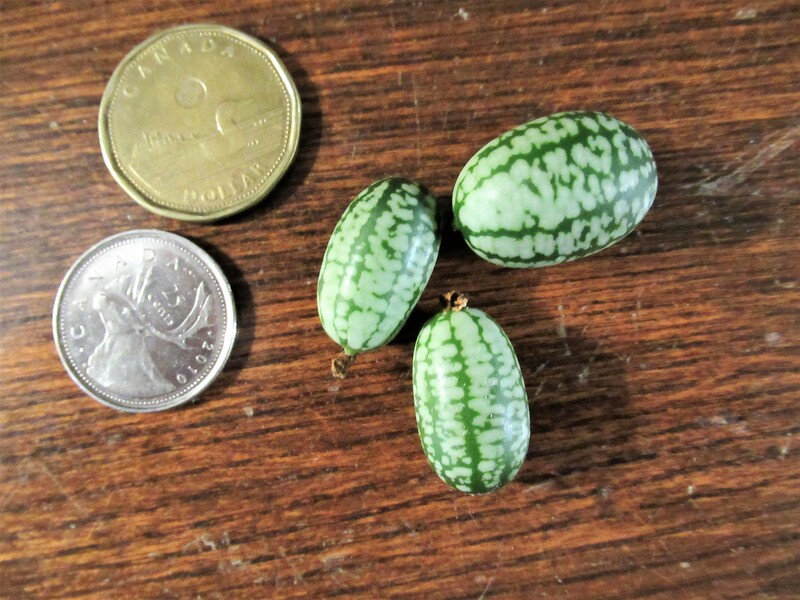 Cucamelons don’t taste like a watermelon, but rather like a tangy cucumber. They can be eaten out of hand or in salads, stir-fries, salsa or pickled. These little guys are turning out great. We had a few to sell at market last week & they were snapped up in a hurry. 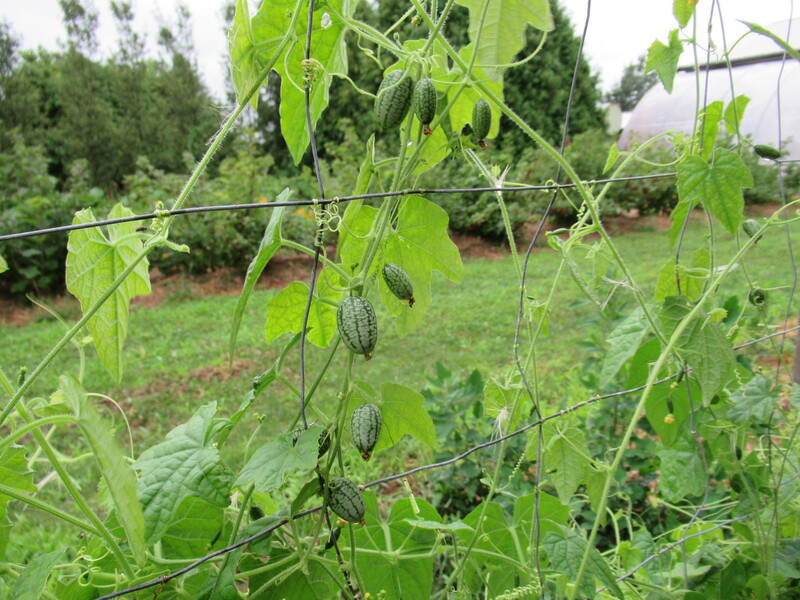 Growing nicely & spreading out on the straw are bitter melons – 5 kinds. 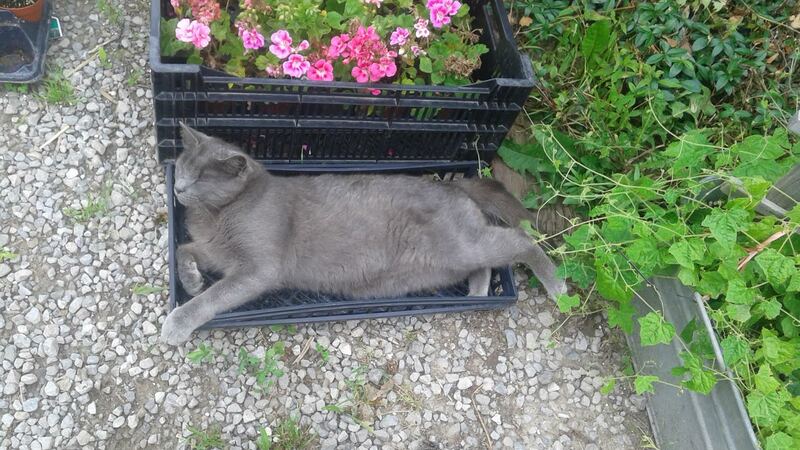 We’ve tried growing them before with little success. Maybe this year is our year? While even the name bitter melons does not sound appealing to me, but they are a staple in many cultures & I would really like to be able to offer them to our customers. 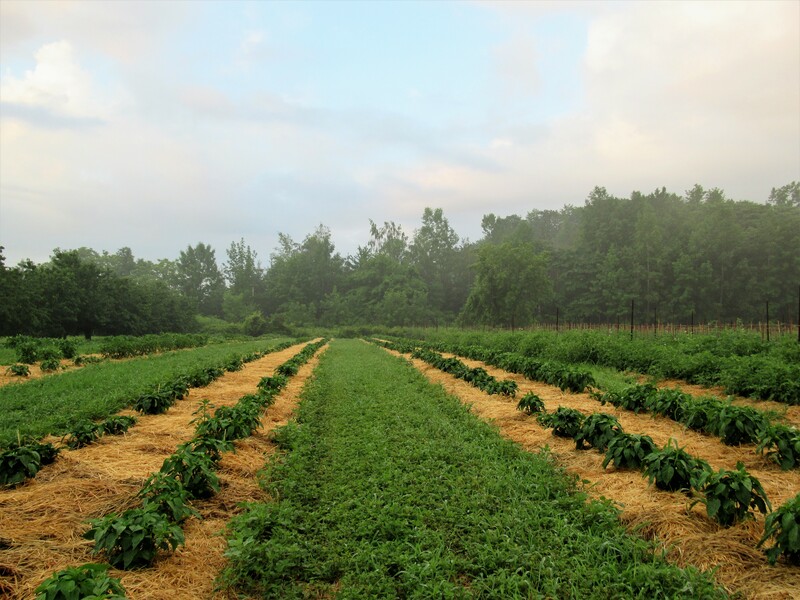 Our artichokes were seeded, transplanted into the field and are growing well – but not as well as the weeds. The overwhelming crop of weeds this season, thanks to the abundance of rain, forced us to make choices as to where we would direct our weeding energies. The artichokes were not chosen! Other less common vegetables that we are growing (or attempting to grow) include fava beans (total crop failure), radicchio (on course for a fall harvest), winter radishes & Asian radishes (to be seeded this week). Some seeds never even made it out of their packages (amaranth, quinoa, sesame, and huauzontle). Maybe next year! Some crops we have not mentioned lately but are doing well. 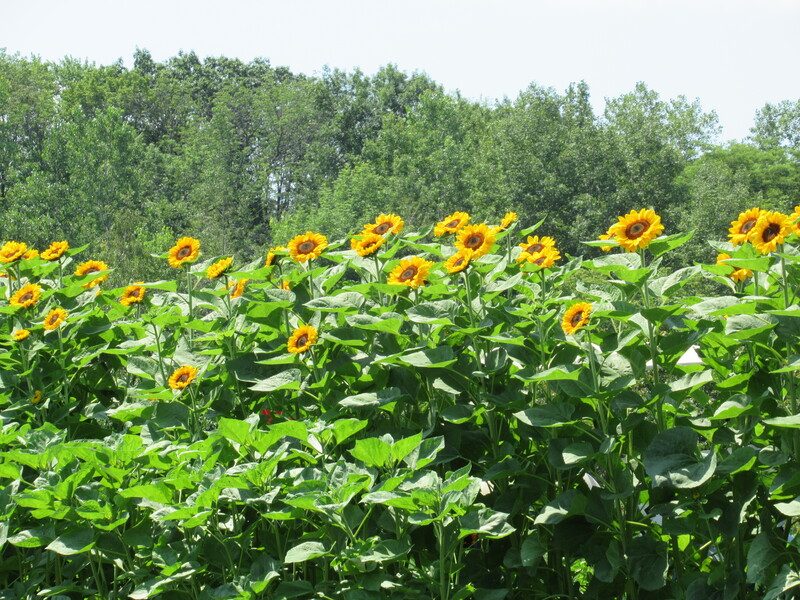 We have made 4 seedings of sunflowers this year. Looking forward to these cheerfully bright blooms! Our new raspberry rows were rescued from the weeds today. Tomatoes, lettuce, onions, zucchini, cucumbers, kale, (beans). 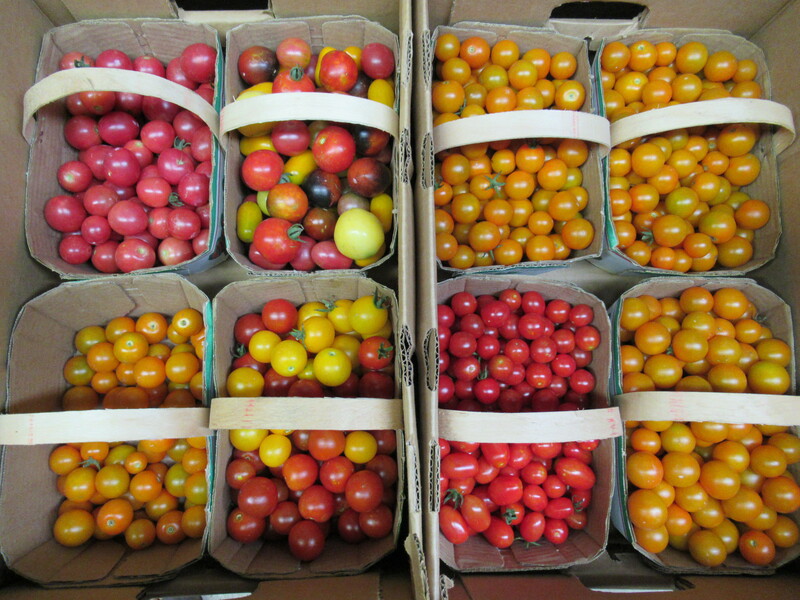 There are finally enough tomatoes being harvested to include them in our CSA share this week. Not a lot, but a hint of what is to come. 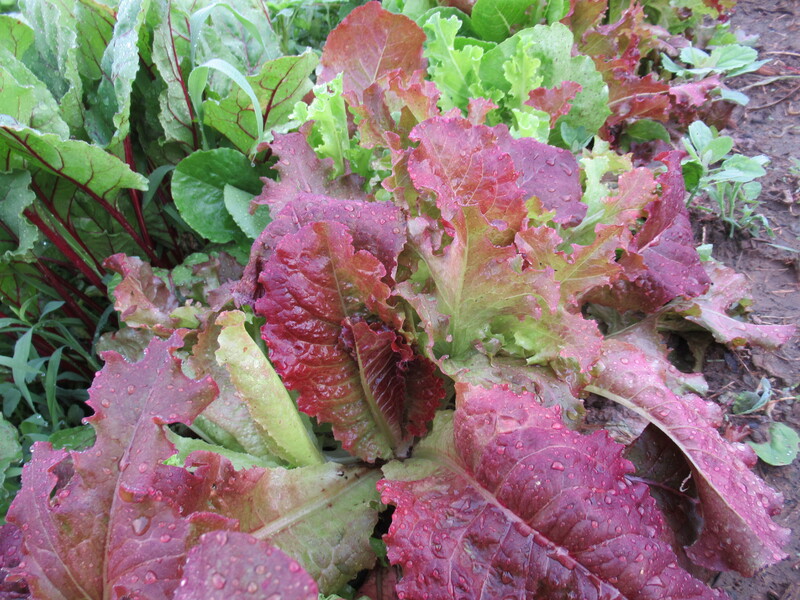 We are still planting lettuce – varieties that are supposed to be able to take the heat. Our hope is to have lettuce off & on for much of the summer. Enjoy your fresh salad again this week. Onions, zucchini & cucumbers are becoming a regular part of the box. A CSA member shared a recipe for zucchini fritters that I have included below. She claims they are great – and she’s right! We made them & loved them. Thanks Rachel! 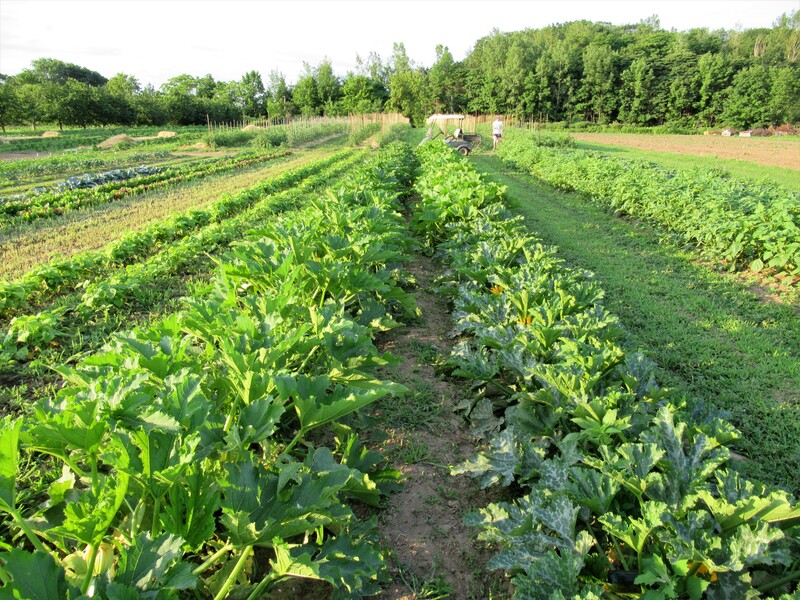 Farmers love kale – easy to grow, dependable, waiting in the field until we need it. Most members love it too. Kale is always a favourite. Beans are a big disappointment this week! We were anticipating big picks all week. However the plants have succumbed to rust & today’s harvest was small & of poor quality. The next planting should be mature for harvesting later in the week. Perhaps Friday pick-up will have beans again? Speaking of disappointments … other crops are showing signs of stress from all the rains. Zucchini, cucumbers, broccoli, tomatoes, even onions & kale are all becoming diseased & declining. New plantings of many of these vegetables are growing, but there may be shortages in the next few weeks. More sunshine & less precipitation would be a big help right now! Two views from our market stall last Thursday. Not a customer to be seen! 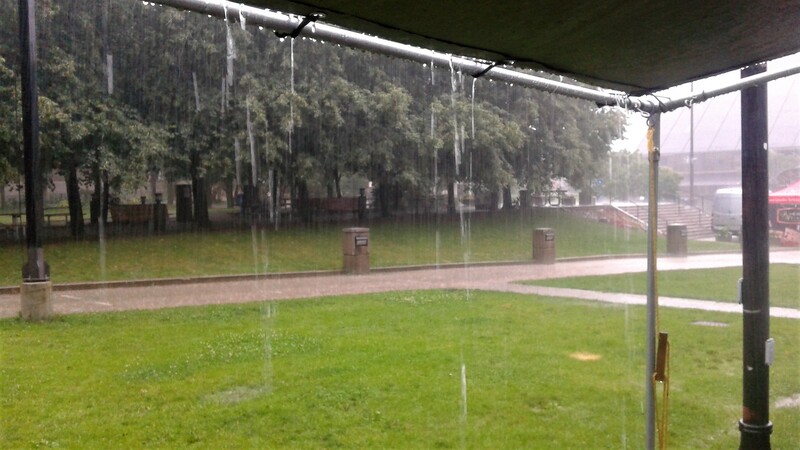 We had almost 2 hours of heavy rains. Bad weather means lots of time to visit with the other vendors & share stories of the difficult season. Most growers have lost crops to the rain & some are not able to replant because the ground is so wet. I guess misery loves company – it’s oddly comforting to know we are not alone in our struggles with mother nature! Bake at 425 for about 20 mins (until lightly browned). This is a view of the area in front of our workshop/greenhouse. 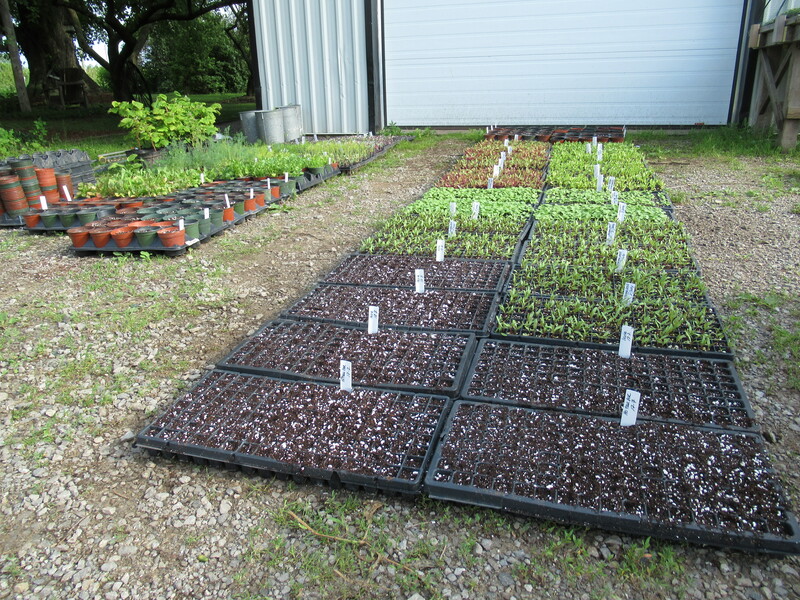 Rows of plug trays filled with seeds & seedlings, trays of pots also containing seeds – some germinated, others newly planted. Normally (if there is such a thing anymore) most of these seeds would have been sown directly into the ground, out in the fields. But not this year. It’s just been too wet to get on the land, prepare the soil and seed! 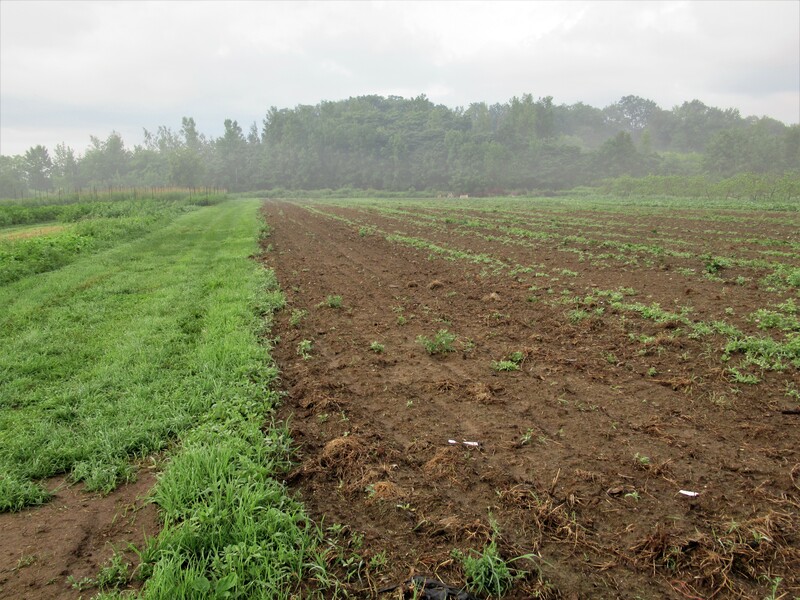 Our options are – wait until things dry up and then seed in the field (which will put us behind) or seed in trays & then transplant the seedlings into the field later (hoping it is dry enough when that time comes). We are doing both! So far things are working out. Our soil is amazing & requires only a day or two to dry off after a big rain. 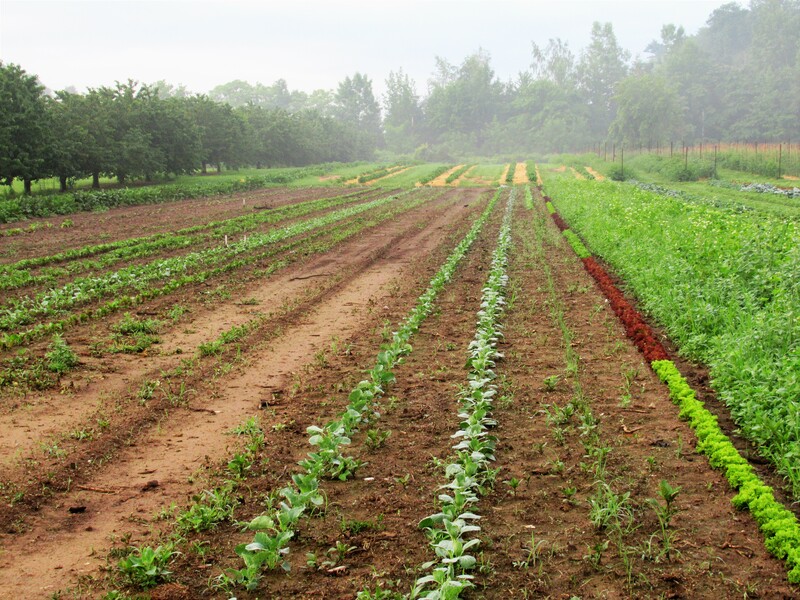 Some seeds have been sown out on the farm when possible including beans, edamame, some herbs … Under more ideal conditions we certainly would have planted more. And we have managed to transplant most seedlings as necessary. We’ve lost some that had to wait too long – but not a lot! Things are never perfect! 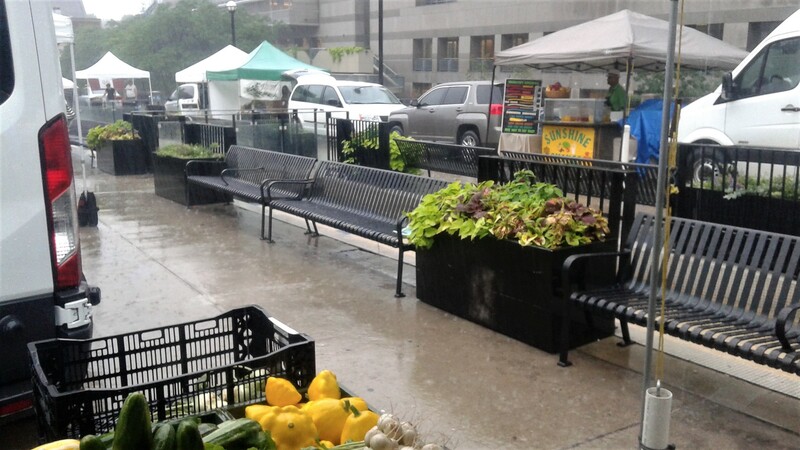 But our CSA boxes will be full & the tables at market will have a good variety of produce. All in all we have little to complain about & much to be thankful for! The forecast this week calls for a lot of sun. We expect to be able to prepare this field for planting in a day or two. 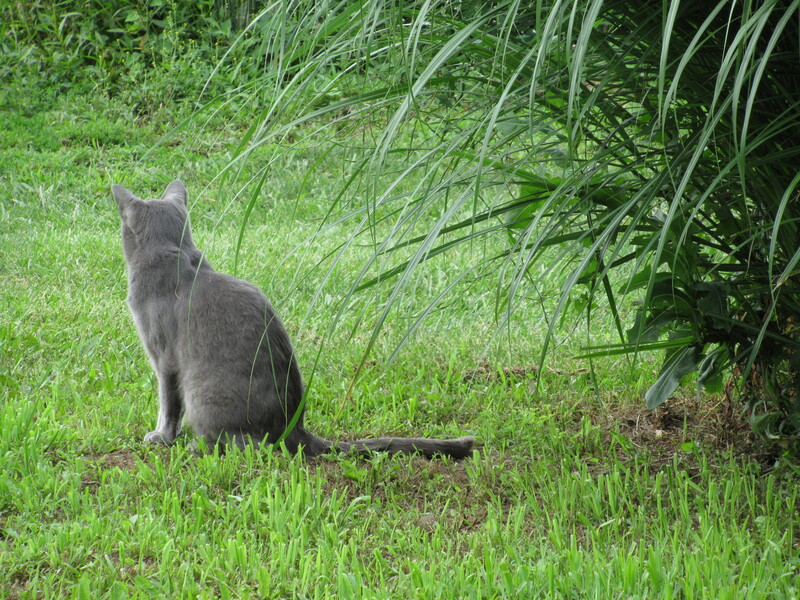 Meanwhile, the weeds are not waiting. They are loving all the moisture & now the warmth and growing like gangbusters. 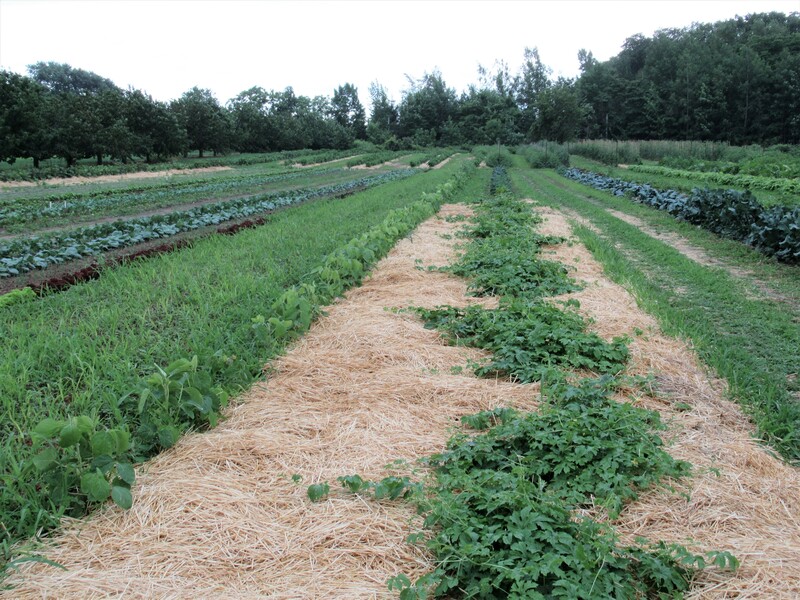 We have finished mulching the peppers & eggplant with straw – out attempt to beat the weeds. Cabbages, onions & lettuces … that were transplanted last week are also doing well. 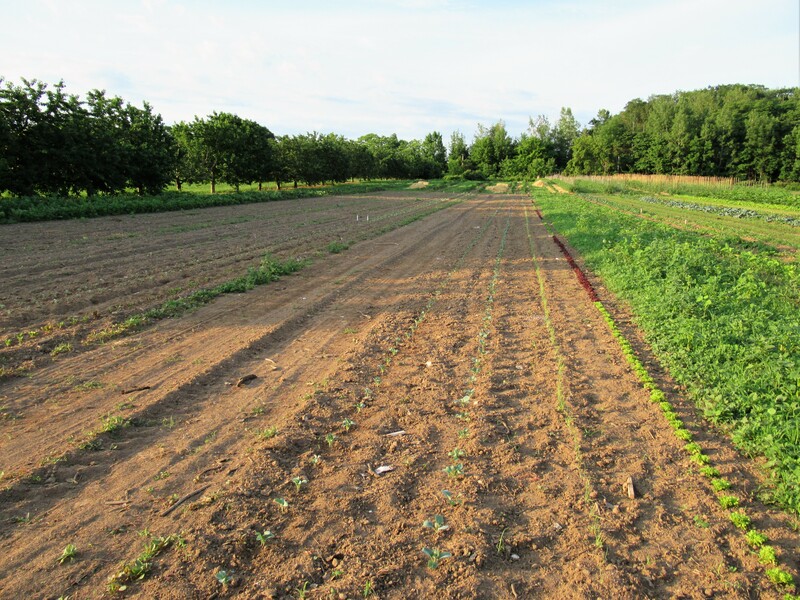 We were able to seed buckwheat where the early peas, spinach & lettuce were growing. It has come up nicely. The buckwheat’s role is to smother weeds now, which will reduce weed pressure next year. Green beans, cucumbers, onions, lettuce, zucchini, broccoli, salad turnips. The first planting of green beans (we’ve seeded 3 times so far) is ready. It is a reduced harvest – too much competition from weeds & too wet – but things should improve this week. Enjoy! When we checked the cucumbers late last week, surprise! There they were. Last Friday’s pick-up already got a taste. Everyone gets cucumbers this week! Probably my favourite vegetable, I eat them many ways – sliced paper-thin with a dressing of mayonnaise, together with tomatoes (they’re almost ready!) in a vinaigrette with lots of fresh dill, or just as a snack. 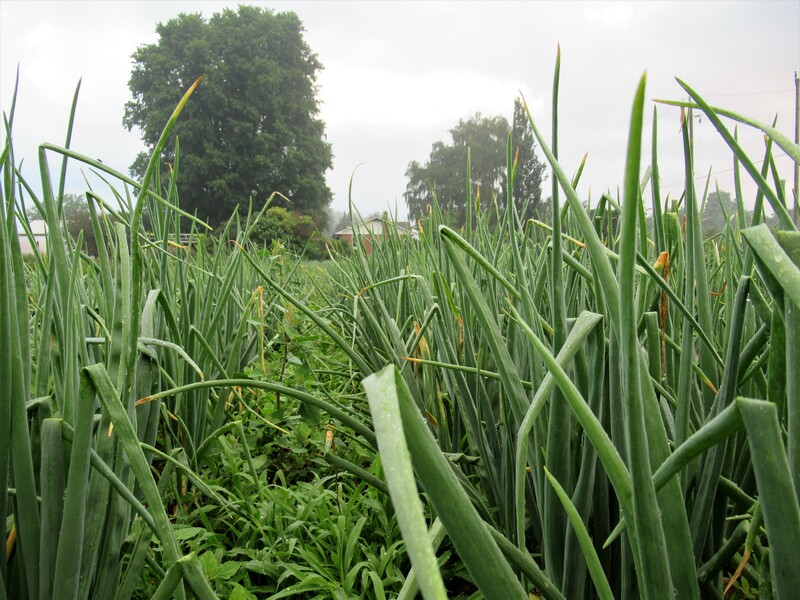 The onion in your share this week – the first of many – will be the heirloom Ailsa Craig variety that we have been growing for several years now. They are a sweeter onion & very delicious. They are still small, but should be bigger each week. Another planting of lettuce is mature for harvest. After a 2 week break from lettuce it’s back in your CSA share this week. Zucchini, zucchini, zucchini! The harvest keeps increasing & increasing. They have almost outgrown the earlier hail damage – both the plants & the fruit. Broccoli & salad turnips make a continuing appearance in the box. Be aware that the broccoli might contain some “friends” or so we’ve been told. Soak them in some cold salt water if you are concerned and the worms should float to the surface. We figure this is a better way to remove them than spraying a lot of pesticide. I have included a simple recipe for salad turnips – something different then eating them raw. Thank you for returning all containers. We can reuse them! This week brings us to the middle of July. The summer is flying along! The farm is lush & green and looking good. Sure there are lots of weeds – we’re understaffed this summer and therefore always behind on the weeding – but we’re trying to embrace the weeds & accept them! More importantly, the crops are doing well overall. 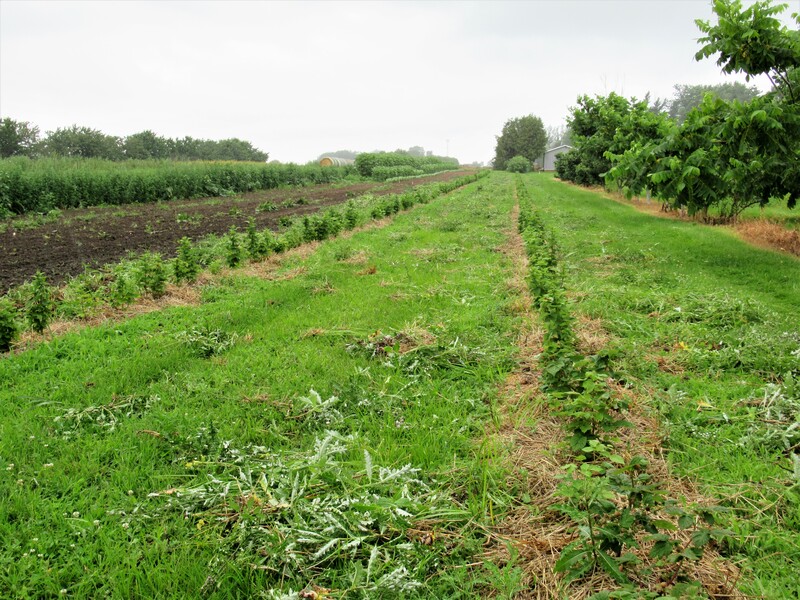 Raspberry rows with a small field of buckwheat behind. 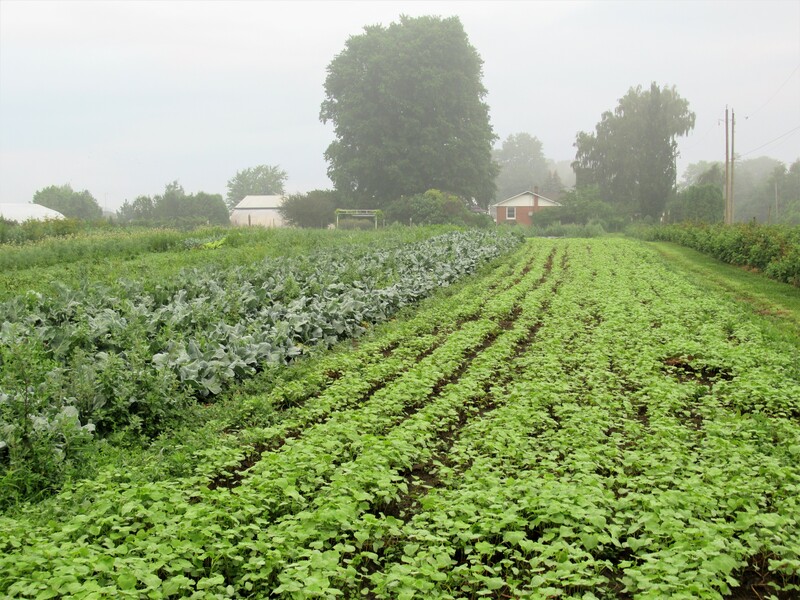 The buckwheat is grown as a cover crop to smother weeds & improve the soil. 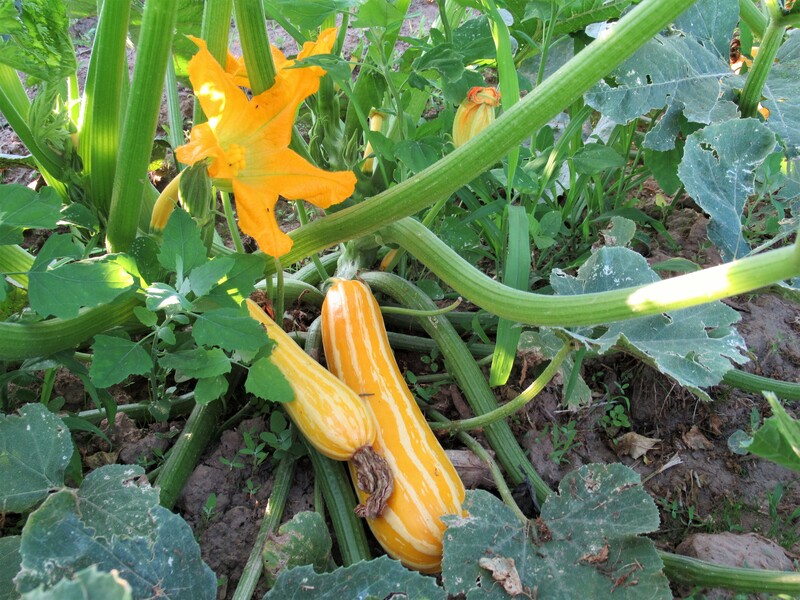 This yellow striped zucchini is a new variety for us. New plantings of cabbages & lettuce. Weedy rows to the right! 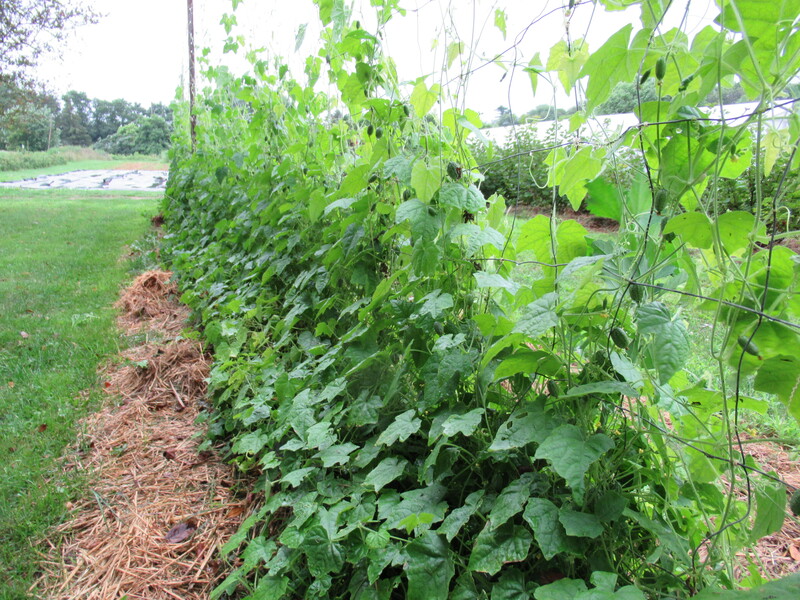 Are there really brussels sprouts & eggplant hiding in the weeds? 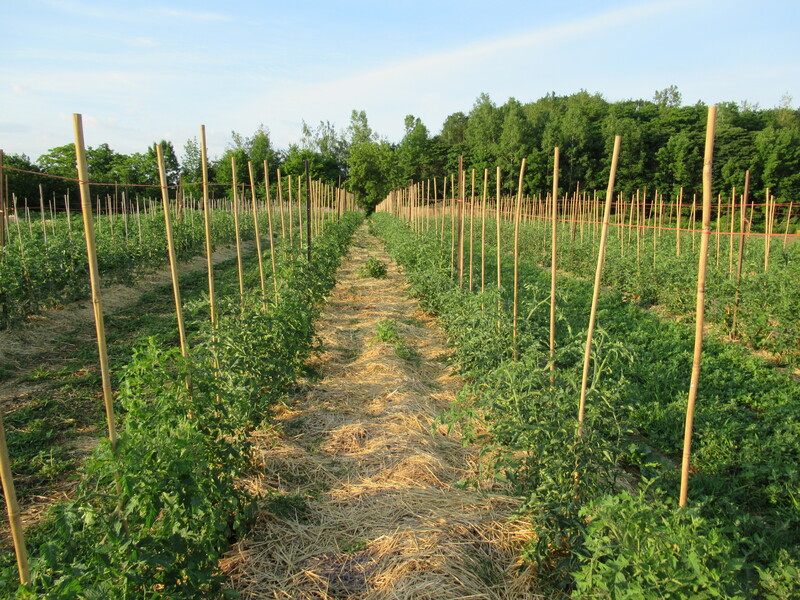 Most of the tomatoes are now staked & tied. salad turnips, kohlrabi, green onions. The raspberries are actually improving! We’re getting bigger picks of better tasting berries. We’re excited to offer them again this week in your box. It is high season for zucchini! We got a massive pick today – of massive zucchini ( and lots of smaller ones too). Don’t be scared of the big ones! They are great for stuffing, grilling on the barbeque, or turning into zucchini bread (or brownies). I admit it. We do not grow the most beautiful broccoli & cauliflower. The broccoli is usually small & the cauliflower is rarely a pristine white. But they do taste good! Our 2nd planting of broccoli is just starting to produce, so there should be broccoli in your share for a few more weeks. Cauliflower might be an option – we’ll see how it is when we pick it tomorrow. We’re putting the beets & mint together. While it may seem like a strange combination, our favourite thing to eat these days is a beet salad with fresh mint. Find the recipe below & give it a try. It’s great! Salad turnips – one of our most successful crops this spring! You are telling us that you like them, so we’re pleased to have another bunch in your share this week. The kohlrabi are getting bigger & bigger … So far they continue to be juicy & delicious. This week should finish off our early planting of green onions. There will be more coming but they are still quite small & several weeks away at least. Beets – spiralized or shredded. Fresh mint – 2 tbsp. chopped. Pour dressing over beets & add the chopped mint. One Flynn catching up on his rest. The other Flynn keeping watch. I was determined not to mention the weather today. Here are some ways it is affecting what is in our CSA share this week – and what isn’t. And what we will be selling at market – and what we won’t. It’s raspberry season – those bright red, juicy, sweet berries that just about everybody loves. 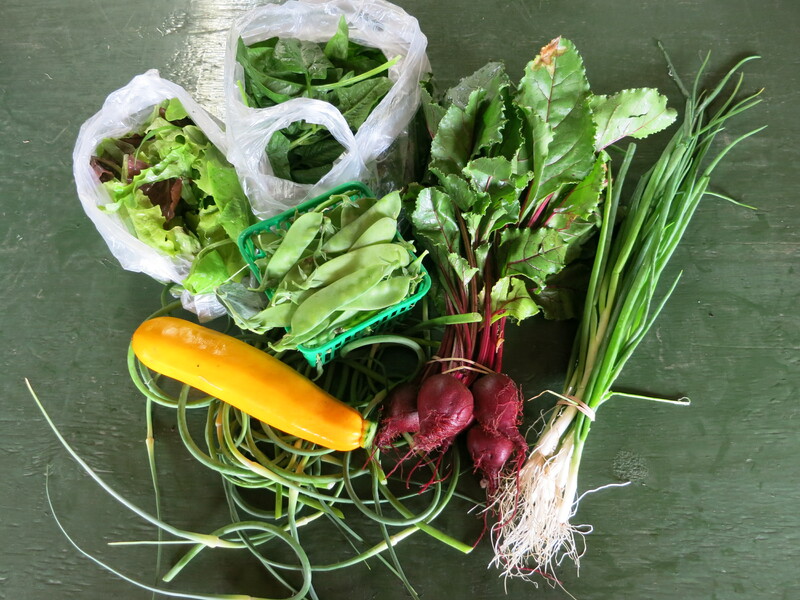 We were able to pick a few last week, but not enough for our CSA boxes, so we took them to market. This week we hope to have enough for CSA. As we mentioned earlier, the drought last year was hard on our raspberries and we lost most of the patch. The few rows that we kept are not great. 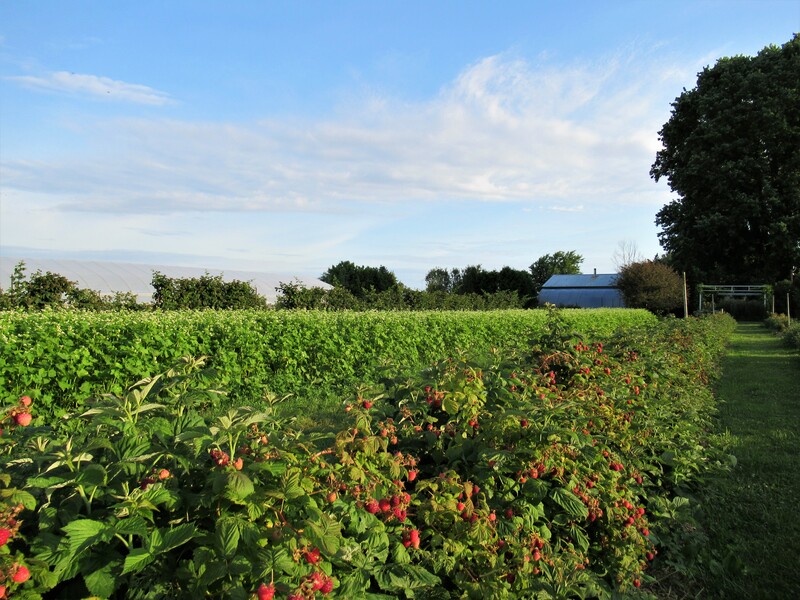 This year’s raspberries are produced on the canes that grew last year – and those canes are short & weak. 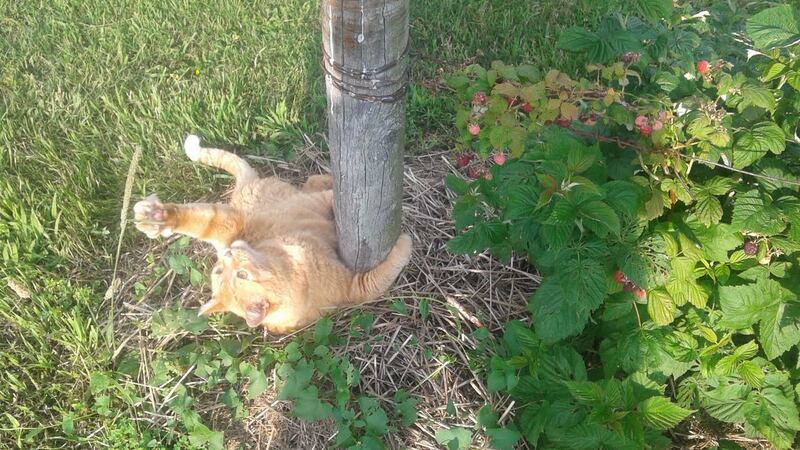 Thus there are few quality berries. Enjoy them because we don’t know if there will be any more. Zucchini – one day there are none, the next day an abundance of them. This season we have green zucchini, yellow zucchini, long green ones with stripes, yellow with stripes, the round yellow patty pans, and some short, green striped ones. They all taste similar, have similar texture and can be used the same way. They also all got hit with hail last week. It left some of them looking a little rough & beat up, with small gouges in the skin. Fortunately they have healed over nicely. Just cut away the blemish. We were very fortunate to receive minimal damage from last Monday’s hail storm. The zucchini has the most visible damage. 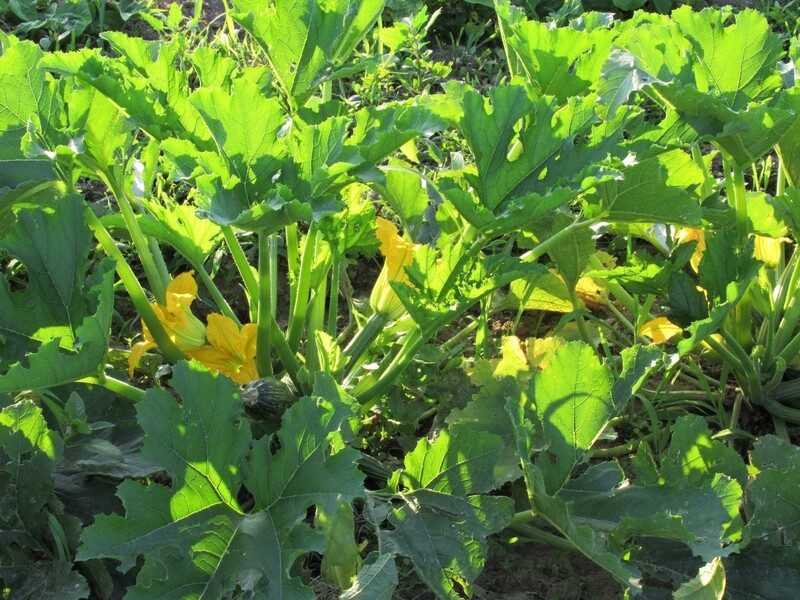 Our winter squash were newly transplanted & the leaves were really ripped up but they are growing fast & there are plenty of new, healthy green leaves. Same with the eggplant. We were most concerned about our tomato plants. Those that were already pruned & tied to the stakes especially had a lot of cuts & wounds on their stems. 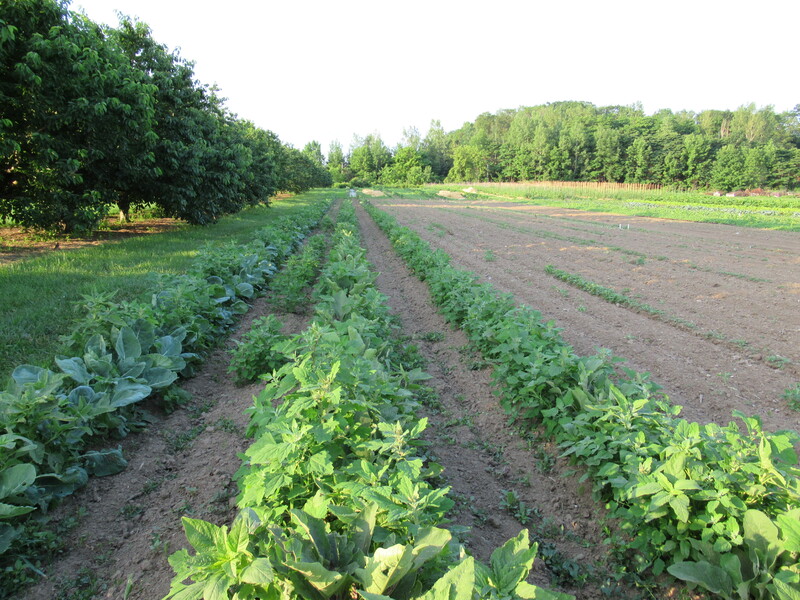 Wary of blight & other diseases setting in, I sprayed them (and the squash & eggplant) with a protective fungicide. So far they are healing nicely & showing no signs of disease. Raspberries, kale, zucchini, kohlrabi, salad turnips. Enjoy a box of raspberries in your share this week (see above). In the unlikely event that any make it all the way home with you, uneaten, keep them refrigerated and use within a day or two. Kale – we have included a bunch of kale in your box, either plain or curly. We enjoy kale raw in our salads, but it is good cooked too. Kale tastes great with olive oil and garlic, onions or leeks. Combine it with sweet vegetables like corn or carrots. Unless the kale leaves are very small & tender, remove the tougher stems before using. The easiest way is to grasp the stem with 1 hand and use the other hand to strip the leaf away with a quick motion.Store kale in a plastic bag in the refrigerator crisper for 3-4 days. * The longer it is stored, the stronger the flavour becomes. The kohlrabi & salad turnips have grown larger since they last appeared in your CSA share. Here is a link to a recipe for kohlrabi fritters that a CSA member shared last year. Some of you have been asking for it again – http://honestcooking.com/kohlrabi-fritters-vermont-csa/ . Lots of useful kohlrabi information is included. Broccoli & radishes have a question mark after them. We won’t know until we pick tomorrow how many there will be. Hopefully there will be enough! 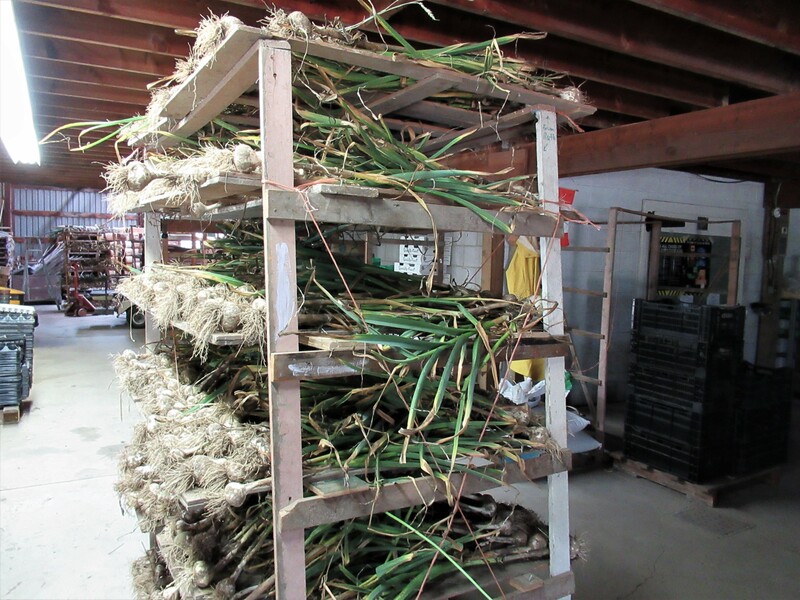 We still have lots of garlic scapes for those who want some. Garlic scape pesto anyone?